Leyland PS2/14 chassis number 540923 was first delivered to Burnley, Colne & Nelson in 1954 with East Lancs B39R body number EL 5042. In 1958 it was rebodied to B39F by East Lancs, body number EL 5340 for one man operation. It is seen here on October 30th 2011, arriving at The Piece Hall, Halifax for the Heart of the Pennines event. 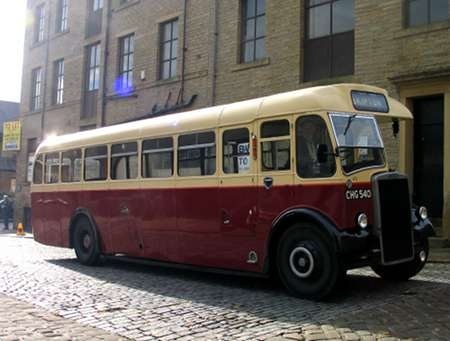 Was it really rebodied after only four years, or did East Lancs give the body a front entrance and other updated features in 1958, with a fresh body number to validate the job ? Otherwise, a new body after just four years seems remarkably profligate of the Committee. Very nice, Les. The cobbled street adds atmosphere! It wasn’t rebodied it just had the entrance moved from rear to front to allow omo. I am pretty sure the whole batch was similarly treated. The new body number must just have been for administrative purposes at East Lancs. The short window next to the rear curved window shows where the original entrance was positioned. Indeed, Bus Lists on the Web shows that 539-546 were all treated similarly, each receiving a new body number in the process.